Retired July 24, 1946. Died November 26, 1960. Brigadier General Thomas DeWitt Milling was one of the pioneers of military aviation. He received his flying instructions from the Wright Brothers and was awarded FAI pilot certificate No. 30 on July 6, 1911. Thomas DeWitt Milling was born in 1887 at Winfield, Louisiana. He was appointed a cadet in the U.S. Military Academy June 15, 1905 and served as such until June 11, 1909 when he graduated with the degree of bachelor of science and was given a commission as Second Lieutenant, Cavalry, Regular Army. Upon graduation, Milling was assigned to the 15th Cavalry, Fort Leavenworth, Kansas, serving from September 1909 to June 1911. He was then sent to Signals Corps Aviation Schools, first at Augusta, Georgia, then to Texas City, Texas, and finally San Diego, California, until July 1913. His next assignment was to duty with the Office of the Chief Signal Officer of the Army in Washington, D.C., until November 1913, when he was sent to Europe on duty pertaining to aeronautics. On July 23, 1914, Milling was promoted to First Lieutenant and assigned to Signal Corps Aviation Schools, first at Galveston, Texas, and then San Diego, California, until March 1916, when he was again assigned to the Office of the Chief Signal Officer, Washington, D.C. On July 31, 1916 Milling was promoted to Captain and August 5 was promoted to Lieutenant Colonel. That month he was placed in charge of Air Service Training in Europe, and later was appointed chief of staff, Air Service, First Army, American Expeditionary Force, and promoted to Colonel. Milling returned to the United States in January 1919 and was assigned as assistant chief, Training and Operations Group; and president of a board which determined all aerial laws, rules and regulations, serving in these capacities until June 1920. His next assignment was as officer in charge of training, Air Service Field Officers' School, Langley Field, Virginia, until June 1922. Following this he was appointed officer in charge and later assistant commandant, Air Service Tactical School, Langley Field, Va., serving until January 1925. Remaining at Langley Field, Milling was appointed operations officer with the Second Wing, serving until June 1925. He then entered the Air Service Engineering School at McCook Field, Dayton, Ohio, completing the course in August 1926. Milling then attended the Command and General Staff School at Fort Leavenworth, Kansas. Completing the course in June 1927, he was assigned to the chief, War Plans Section, Training and Operations Division, Office, Chief of the Air Corps, Washington, D.C., where his duties were mainly administrative in connection with war planning and legislation. In June 1930, Milling was sent to the Colorado National Guard in Denver, Colorado to serve as an Air Corps instructor. Upon completion of this assignment in September 1931, he served briefly at Rockwell Air Depot, California, and then was admitted as a patient in Fitzsimmons General Hospital, Denver, Colorado, the following month, remaining there until July 1933. Milling retired from active duty July 31, 1933 and remained in this status until shortly after the start of World War II. He was recalled to active duty in the grade of Major March 16, 1942 to serve as a member of the War Department Decorations Board in Washington, D.C. He was promoted to Lieutenant Colonel April 27, 1942 and to Colonel September 24, 1942. In December 1942, Milling was designated as air member, Joint Intelligence Sub-Committee and later was a member of the Joint Intelligence Staff, Office of Assistant Chief of Staff, Intelligence, serving until December 1943. That month he was again appointed as a member of the War Department Decorations Board, serving until March 1946. Milling reverted to retired status July 24, 1946. He died at Walter Reed General Hospital November 26, 1960. Although Milling never actively served in a general officer rank, he was advanced on the retired list to the rank of Brigadier General, as approved by Congress June 13, 1940, with same date of rank. General Milling has been awarded a number of decorations, including the Distinguished Service Medal; Legion of Merit; Most Excellent Order of the British Empire, degree of Honorary Officer; Officer of the Order of Leopold (Belgian); French Legion d'Honneur (Chevalier). 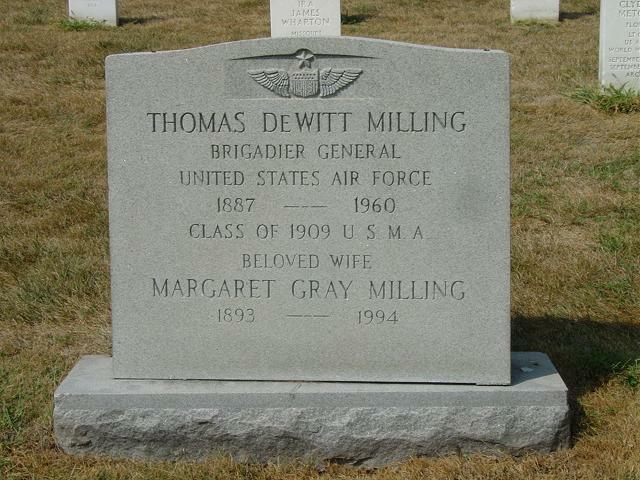 For Early Bird Thomas DeWitt Milling, aviation was a career spent in the service of the United States. A graduate of West Point in 1909, he was one of the nation's first military pilots and attained the rank of Brigadier General (retired) in 1940. On Saturday, November 26, Brigadier General Milling died at Walter Reed Medical Center, Washington, following an extended illness. He was seventy-three years of age. General Milling, who learned to fly under the tutelage of Orville Wright, was hailed at one time as "the greatest all-round airman in the world." Following instructions at the Wright Brothers Flying school in 1911, General Milling helped organize Army Aviation Schools at College Park, Maryland, and Augusta, Georgia. From 1917 to 1919, General Milling was in charge of air service training in Europe, and also was chief of staff of the air service of the 1st Army with the American Expeditionary Force, and served as General "Billy" Mitchell's chief of staff. He retired in 1933, but was recalled to active duty in 1942 during World War II. General Milling was awarded the Distinguished Service Medal, the Chevalier Legion of Honor of France and the Order of Leopold of Belgium. In 1925 he appeared before an air board to bolster the then-unpopular stand for the creation of a separate air service and supported General Mitchell for the creation of such a force. General Milling had a high regard for the early airman. "Each student flyer," he recalled, "after he had learned to manage his plane in still air, had to learn by experience the effects of strange wind currents, wind gusts and the influence of the terrain --- he had to do this with no instruments,,,no parachute, and practically no horsepower. The only instruments he had were his eyes, ears and a sense of touch. His wife, Margaret, and a daughter, Mrs. Joseph S. Gardner, are among his survivors. Interment was in Arlington Cemetery.